This script helps to avoid BT connection problems if you want to connect several PS3 and Shawan controllers to your Pie. If you are connected by eth0 and wlan0 so you will see 2 IPs. If you disable the wifi connection then only eth0 will be active and only one IP is showen. Therefore this script says... "There may be an wifi adapter active" because it checks just radio devices with rfkill. wget http://raw.githubusercontent.com/crcerror/RetroPie-Shares/master/rfkill_wifi_dialog.sh -O "/home/pi/RetroPie/retropiemenu/Wifi Switch.sh"
wget http://raw.githubusercontent.com/crcerror/XU4-ORA-scripts/master/wifi_toggle_dialog.sh -O "/home/pigaming/RetroPie/retropiemenu/Wifi Switch.sh"
Been fighting with 2 x Wireless PS3 Shanwan clones all day but this has totally fixed the weird problems i was having. (Random Disconnects, Lag, both reconnecting using same channel etc) Thanks Heaps. @Pi-Mania Novice Pi user here. To get this installed do I hit F4 go to CUI, then simply type 'wget http://raw.githubusercontent.com/crcerror/XU4-ORA-scripts/master/wifi_toggle_dialog.sh -O "/home/pigaming/RetroPie/retropiemenu/Wifi Switch.sh"' to install this? @common763 What image have you used for installation ? The pigaming user is specific to the Odroid image. I just went to the RetroPie site, downloaded v4.4 for the Raspberry Pi 2/3. Then flashed to the SD card. Did it on Windows. Looking to fix issues with bluetooth and PS3 controllers going haywire during gameplay. Someone recommended this thread. wget http://raw.githubusercontent.com/crcerror/XU4-ORA-scripts/master/wifi_toggle_dialog.sh -O "/home/pi/RetroPie/retropiemenu/Wifi Switch.sh"
Thanks. One more stupid question. Will running this affect my wi-fi connect to the PC when I transfer files and such? @common763 Of course, this will stop the Wifi radio so the network connection will not be possible via Wifi. You can toggle it though from the menu (on/off) whenever you need (or not) the Wifi connection. ok. thanks for the help. Will give this a shot to see if it fixes my issues. I just ran this. The Wifi Switch is at the bottom of the RetroPie Menu. When I select it does the same thing that a rom does without the proper bio...just goes back to the screen. ANy suggestions to what I am doing wrong? @common763 All set. I replaced wget http://raw.githubusercontent.com/crcerror/XU4-ORA-scripts/master/wifi_toggle_dialog.sh -O "/home/pi/RetroPie/retropiemenu/Wifi Switch.sh" with wget http://raw.githubusercontent.com/crcerror/RetroPie-Shares/master/rfkill_wifi_dialog.sh -O "/home/pi/RetroPie/retropiemenu/Wifi Switch.sh"
Excuse me Sir. The XU4-ORA script does NOT work for Raspberry and vice versa. 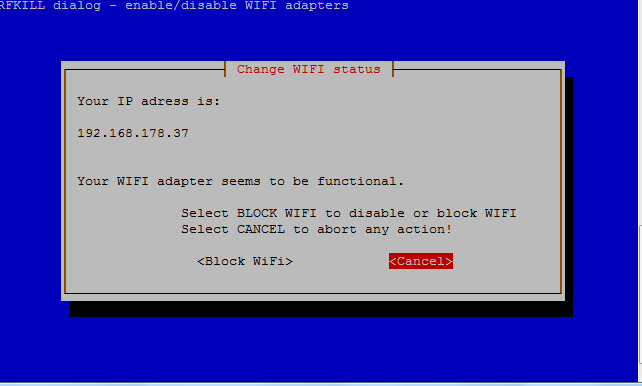 @Shaddonai I'm not sure, rfkill can selectively disable/enable Wifi individually, I'm not sure the script can do that (i.e. choose which Wifi connection to stop). But, as you said, if you use it before you're adding your Wifi dongle, then it should be fine. @Shaddonai There are more effective methods available to block onboard wifi. Add dtoverlay=pi3-disable-wifi to boot/config.txt and then it's device drivers are not loaded during boot. rfkill behaves like a software toggle and I assume if you plug in annother WiFi device then the whole stack will be resetted. Means both connections are active but not if you use the overlay above. @cyperghost Actually I am searching for an sript that let me disable the onboard bluetooth by modifying the config.txt, but I did not find one so I am trying with rfkill. If you know an script like that, please let me know. @clyde Now I understood. Yes if you launch the joy2key command you can use up and down to switch through bash history. But the way you made it is a bit confusing as the joy2key programm is always active in background. This can cause behaviour you do not want to happen. I would suggest to use dialog function for this. you need an internet connection to install additional packages. @ruckage nicely done and good find with the shorter cable - I'm gonna pick one of those up for myself. @rod419 said in Noob Dilemma: No IPV4 address/No SSIDs Showing up: Also I can't seem to SSH from my PC, regardless of what IP I use. Well, if there is no network configured it's not possible to use SSH to the PI, unless you have a wired connection. If you have one, then you first need to enable SSH, since it's disabled by default - use the raspi-config script (see here). Remember that the PI 3 only connects over 2.4Ghz, so if your access point only works in 5Ghz, then you'll not see the SSID. This happened to me the other day. Maybe the external wireless adapter has 5Ghz support and that's why it's able to connect. Here is a Wireless configuration guide for the PI - including command to scan for SSIDs and configure the wireless from command line. @mitu , thank you for your reply. There is no specific problem, just trying to increase my knowledge about how does the retropie_setup script works. =) @BuZz , thank you. I'll try it! I believe this should also work for the other piece of codes. ;) @Trailjacker , I'm happy my question was useful in you scenario. Thank you guys!